NEW ORLEANS – Just about two months from now the 2018 NCAA Division III Indoor Track & Field Championships will be held at the Birmingham CrossPlex in Birmingham, Alabama, site of the NCAA Division I and NCAA Division II meets the past two years. 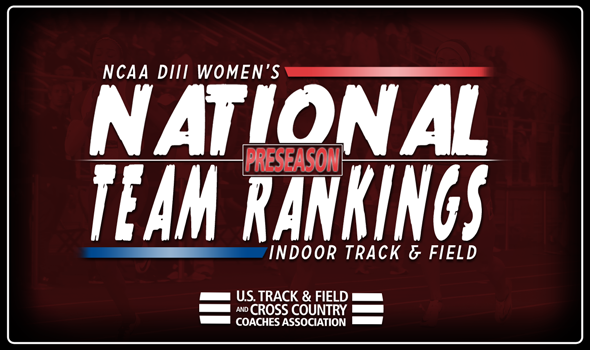 A lot can change between now and then, but the Preseason National Team Computer Rankings predict Oberlin to walk away with the team title. The Yeowomen had never been ranked higher than 12th in any previous index, so this is a banner day for them. The top-5 looks much different behind Oberlin as graduation took its toll on the nation’s best. MIT is No. 2, followed by Misericordia at No. 3, Ithaca comes in at No. 4 and Ohio Northern remains where it finished at NCAAs last year (fifth). So what makes the Yeowomen the team to beat? Well, their throwers are among the best in the nation as Monique Newton and Naeisha McClain will certainly leave their mark. Newton enters the season No. 1 in the shot put and ninth in the weight throw. McClain is ranked fourth in the shot put and fourth in the weight throw. Other difference makers could be Linnea Halsten in the 5000 and Ana Richardson in the throws as well. The Engineers have a plethora of athletes ranked in the top-5 of their respective events in the USTFCCCA Individual Rankings. Nneoma Okonkwo is the best of the bunch at No. 2 in the long jump, followed by third-ranked Bailey Tregoning in the 800, fourth-ranked Kari Stromhaug in the pole vault and fifth-ranked Hannah Chen in the 400. Potential success for the Cougars relies on how they use standout pentathlete Reilly Wagner. Right now Wagner is ranked No. 2 in the pentathlon, No. 3 in the high jump and No. 5 in the 60 hurdles. That’s plenty of points there if Wagner does all at NCAAs. Watch out for Oniesha Clarke, too, who is ranked second in the 60 and long jump. The Bombers have 20 or more potential points on the board from Taryn Cordani and Katherine Pitman. The former is the top-ranked athlete at 5000 meters and could move up the chart at 3000 meters, while Pitman is the NCAA DIII record holder in the pole vault. Emily Richards is a one-woman wrecking crew for the Polar Bears. Richards is ranked No. 1 in three events right now: 800, mile and 3000. She also turned in one of the fastest performances in NCAA DIII history over 3000 meters earlier this season with a time of 9:23.61. Madison Reed is going to be an important source of points for Ohio Northern as well as she is currently ranked No. 2 in the pole vault. Other teams in the top-10 include No. 6 Williams, No. 7 Chicago, No. 8 Bridgewater (Va.), No. 9 Johns Hopkins and No. 10 George Fox. Defending champion Washington (Mo.) didn’t crack the top-25.